Happy February everyone! I have finally cleaned, sorted, and put everything away after Craft Napa retreat last month and guess what I have extra of…SWAG BAGS! 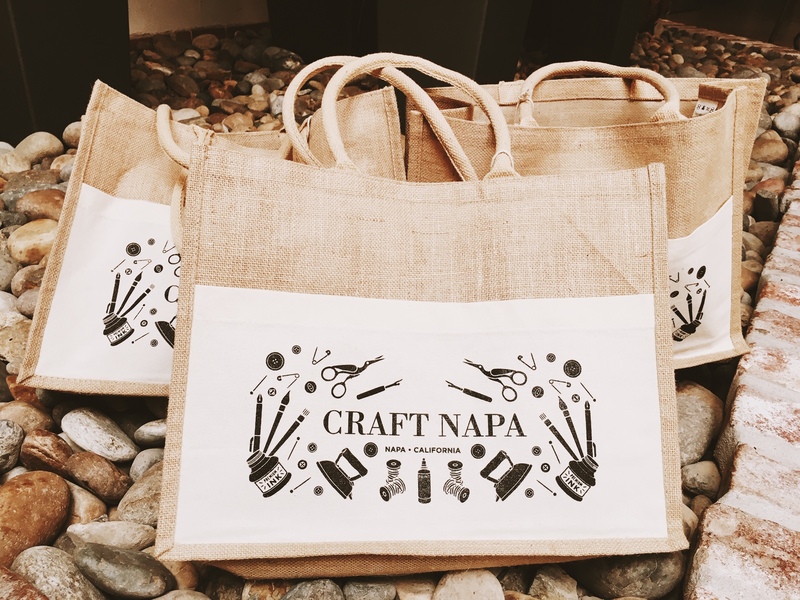 I thought I would give a Craft Napa swag bag away once a month for the next six months. UPDATE: Patti Kaplan, you won the swag bag! I will email you to get your mailing address! Quiltfolk Magazine Thanks to the publisher, Michael McCormick, Craft Napans received a complimentary copy of Quiltfolk! Want to subscribe? 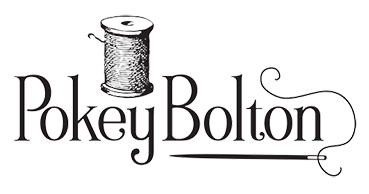 Use the coupon code CN19 for 15% OFF at Quiltfolk.com. It’s “CN19” and can be applied in the cart. 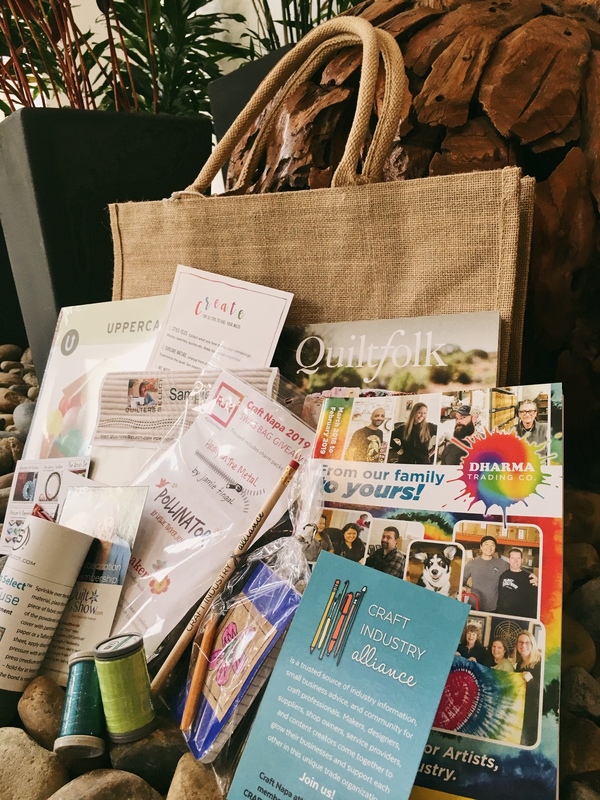 Quilters Select—MANY thanks to Alex Anderson, Quilters Select, and parent company RNK for generously providing all of these incredible supplies! Visit https://quiltersselect.com to see all of their offerings! Dharma Trading for generously providing surface design supplies for class use and selling supplies most of Craft Napa. They are running a special discount just for Craft Napans and friends. Visit https://www.dharmatrading.com. Use coupon code CRAFTNAPA10 to receive 10% off your order! Havel’s’ Sewing—This is personally a favorite scissor, rotary cutting, and mat company of mine! If you have not tried their products yet, I recommend doing so ASAP. They cut like butter. Visit https://www.havelssewing.com. Please answer the following question in the comments area below, and I will randomly select a winner next Wednesday (February 6th). I apologize to our international friends, but because this bag is heavy and expensive to ship internationally, I can only ship to those who reside in the United States. I was honored to be asked to give the opening keynote at the annual SAQA Conference this upcoming April in San Jose, CA. The theme of the conference is Threads of Innovation. I have been thinking long and hard how what I might say may have relevance to anyone in the audience–mostly enthusiasts and professionals in the quilting industry. In the context of this theme…what would you be interested in hearing or learning about from me? Just hearing your words of wisdom are enough to motivate and jump start my creative juices. Thank you for all you do. How do you keep fresh and stay bringing new energy and creativity to your work? What inspires you? What do you do when you’re feeling overwhelmed, underwhelmed, or in need of the fresh and new? Threads of Innovation is a very exciting theme and hearing your thoughts and ideas on creating sounds like some juicy information to get everyone’s minds working on their next artwork. Thanks, Pokey. Please enter me into the give away. I would love to hear a discussion on how our art and crafts stay relevant in a world filled with chaos and noise. And I mean relevance beyond the peace the making often brings to us. While I suppose your audience is largley self directed and motivated, I would like words to encourage those of us stuck on dead center. When our home was extensively damaged in Hurricane Florence and we shifted to an apartment so that repairs could being and progress, I seem to have lost all momentum and direction. I could rescue sewing machine but so far have not. The storm was in September and we hope that repairs will be more or less complete by end of March. I am hoping to find that creative spark once more. I would love to here how computer technology has changed quilting. Innovative techniques or tools of the past; how they have evolved today, and where manufacturers are headed in the next 5 years. I’d like to hear how innovation has led you to where you are today. I’d be most interested in hearing about why we all love this activity so much- is it the neuroscience (the thing that creating does to our brains), is it the community (you can always find and connect with another quilter), is it the fact that it never stands still, and there is always some new tool or technique? It appeals to artists, mathematicians, engineers, crafters, shoppers, kindergartners, historians- I’ve never met a more engaging hobby. With all of the quilts you see how do you quiet the “noise” to do your own work? Social media marketing for quilters and quilt teachers and/or how quilters can use technology to grow creatively and financially — these would be my favorite topics to learn from you! I would love to hear what sparks your inspirations and how your artistic inspirations have changed over the years. Have seen you on television and at the Houston Quilt Show, I feel like I know you. But any words of wisdom would be welcomed. What keeps you going creatively? How do you get your inspiration? I imagine many of us have hundreds of digital photos that we have taken. So using the ever changing tech world to bring our photos to life. Not just on expected fabrics, but on ????. So knowing new sources and ways to do this would be most inspiring for me. Mixing it up. Like Thread Art on Crazy Quilt Blocks. Multi media on wall hangings. Dying Fabric to use in art quilts. Mixing old quilt patterns with new techniques. Techniques/resources you use to keep your creative juices flowing. To enhance our fun when we create. An interesting topic may be the use of cutting edge technology and it’s used in the fiber arts. I find many new technologies quite intimidating. I have noticed trends and how the Quilting and Arts have changed over time. From in person classes to online. Hard copy to digital subscriptions. And the look of quilts being made. What if any, affect does it have on new and seasoned Quilters. You will be Great on any subject. How have you grown your Crafting a Life business? So excited for the conference because my daughter is on the agenda, too!! I would love to hear about the shift you have seen in art quilts over the years. Where do you think we are heading? How do you put together your slate of teachers? Anything you’d have to say would be relevant. I do appreciate knowing the newest and upcoming trends in the quilting industry. I also appreciate any information on growing your business. ‘Threads’ of course keeps us in SAQA territory since the majority of artwork made by SAQA members is with thread and fabrics. I guess the question is really “Is there any real innovation happening in the thread-related arts or are there just trends that pass in and out of fashion?” Let’s face it–anyone in the thread-related arts stands on the shoulders of giants. Whether it’s Sonia Delaunay’s rugs , quilts, and clothing (20s and 30s) which owe a great deal to African art of an earlier century or more recently Jacqui Gering’s abstract quilts that are solidly mid-century modern in style. We get to choose our roots is what I’m trying to say and we’re very lucky to have so many fine examples of work from the past to inspire us. There is renewed interest in all kinds of “handwork” these days. I wonder how the fabric designers are changing their designs and fabric content to complement the handwork craft movement. Would like to know how you manage to find time in a busy schedule for sewing and quilting. I have a new sewing machine that has stayed in the original box for a month now. Every time I look at it I say: “I need to get going with that.” How do you schedule time for creativity? I would like to know how you locate innovative fiber artists and what prompts an invitation for them to teach. I would love to hear about how important it is to teach our next generation to learn quilting and sewing and what suggestions you may have for us to increase interest. Interested in knowing your background how you came to develop Quilting Arts TV and magazine (and Cloth, Paper, Scissors? ), why you decided to leave QAT&M et al and what the inspiration was to develop Craft Napa. I might address the innovative things that have occurred in just the past 20 years or so, including the new directions that the quilting industry has taken lately – quilting on leather, for instance. Domestic machine quilting evolved into long arm quilting, with additions of computers and digitized designs. Hand quilting still being done, but with new eyes – big stitches, Sashiko and Boho stitching, etc. Using more unusual materials, instead of limiting to cotton (think wool, minkee, found objects, etc.). Better tools – rotary cutter, cutting machines, etc. I love the innovations I have seen in my short time being involved in the industry (almost 20 years). I would be really interested in a discussion and slide presentation of the many ways textile artists are creating their own fabrics vs purchasing commercial fabrics. What does it mean to be innovative in this era of social media. How to find one’s own voice or design style. We are constantly reinventing ourselves because of life changes, economics, health, politics, world views, creative interests, economics, changes in location, family matters, etc. How does our art reflect these changes, how do we redirect ourselves to that new emotional destination, how do we arrive at that new place in our lives where the art flows (albeit our mental blocks). How do we learn to play again? First of all congratulations on your request to speak. Today the quilting industry is in a transitional period, I would speak of change and how it impacts us as quilters. Whether you are a traditional,or modern quilter or somewhere in between we all have a voice. Through our mutual love of the “:art” there is room for everyone. We share common ground. I would like to learn how the various areas of the quilt industry drive each other. How do they interact with each other? What drives color trends in the industry? What starts certain movements? i.e. slow stitching, art quilting, etc. I would like to hear about your journey from Interweave to where you are today. The highs and the lows and what has kept you going. Hmmm…threads of innovation? Well, i’ve Only been quilting for 2 years and know little about the best threads to use when sewing the pieces together versus threads to use for appliqué and for quilting the layers. That would be helpful ! I’m also very interested in art quilts, so along those lines, I would be interested in info regarding fibers to incorporate into quilts, like what types and how to! I look forward to hearing your presentation details! I’d like to hear how our mother’s, grandmother’s and ancestor’s innovations got us to where we are today. Where are their innovations taking us today and into the future? I’d love to hear your thoughts on where you think the quilting industry is going in the next 5 to 10 years. How has social media helped you over the years? What made you decide to open your own business in your own building built from the ground up instead of renting/or buying an already built building? discussion on how our art brings serenity in our personal lives – mindful clarity. How we have ideas and focus on the project in front of us. And about sharing our art with others, is a creative communication. Each of us can listen to our inner thoughts as the art in front of us inspires us. A creative communication. Back in the 1980’s and 90’s, art quilts and non-traditional quilts were roundly attacked and rejected at quilt shows. Now, they seem to be the norm, if not the MAJORITY at some major shows. What made the difference? What is the “new outcast” in quilting circles? Or is anything goes now? What are the major changes for art quilts and textile art that you have seen since you began Quilting Arts Magazine, where do you think textile art is going…. we’re not mainstream yet, but are we where photography was in the 70s, when it was starting to be accepted and is now considered an art form? Farther along? What can both artists and the industry do to help the interested but uninformed learn about textile art? In this era of creativity, with all the cool things that people invent for many reasons, I would love to hear your input of how we can keep our enthusiasm and try many new ways of re-inventing ourselves and our art! That’s the key for me – using my creativity to take an unrelated object or new art tool to discover some new way of expressing myself! I would love to hear where you think the industry is headed and how past innovations in the industry have affected your career. Thanks for the giveaway! Do you think it would be relevant to discuss how tariffs with China will affect the cost of fabric and other quilting related items imported from China? Also, do you have any knowledge of more manufacturer buys or take overs, ie, Free Spirit (thank goodness for them)! And I recently heard a Canadian company has purchased Coats and Clark, how and if this would affect us. I think you have great background to speak as an innovator. You turned your dreams into reality many times, from the magazines to moving home and developing your own publishing company, not to mention Crafting a Life. I have high hopes of being at Craft Napa next year but until then the swag bag would be oh so much fun!!! I’m finding that many of the “new” innovative things are actually old things that have been around for years, just done with newer products and viewed with fresh eyes. I think it’s all very circular and I’d like to hear your thoughts on that. I have been following you since I bought myself a subscription to QA many years ago. (I was intrigued by the art quilt of suitcases at Ellis Island). It would be interesting to hear about the changes you have seen and where the quilt world is heading. Sorry I couldn’t join you this year. I would welcome your ideas for developing/encouraging a creative spark when it has disappeared for any length of time. I think the difference between Innovation and Creativity would be interesting. How to pursue both and what new avenues of media are available for the artist. Congratulations on being asked to be the keynote speaker! Wow! Now that I live in the States I can participate to your contest!!! Line Rondeau, formerly from Montreal now living in Murrells Inlet, S.C. I would love to hear ideas about keeping creativity fresh and new. I think a reminder of how the roots of quilting is so important in our current patterns and how mostly nothing is entirely new. I am sure you can state that better!! I’m interested in hearing about innovation in content rather than physical, mechanical innovations. The quilting world keeps expanding and it’s good to talk about it–or about how technological innovations encourage us to innovate (make changes in something defined and established). The topic of threads makes me think of how tapestries are unclear from the back, but the front side is very clear what the design is. Whereas, with quilts, the backs are just as clear as the frontside, though it may be a completely different “image” than the other side. So “perspectives” of a quilter would be great to hear from you – from both sides: personal and professional! Lately I have been thinking of my grandmothers—one who sewed out of necessity and of that era and one who did the same, but also for pleasure. How did they view various “threads” ie, fiber, which was most prized, how did they choose what to make out of upcycled fabric,, etc., history of fabric of the 20th century in the U.S. then speak of new innovations in fabrics now. I often wonder what my grams would think of the fibers we have now, perm press, access to internationally made fiber, etc. I would be interested in hearing about innovative ways to use upcycling in fiber art. 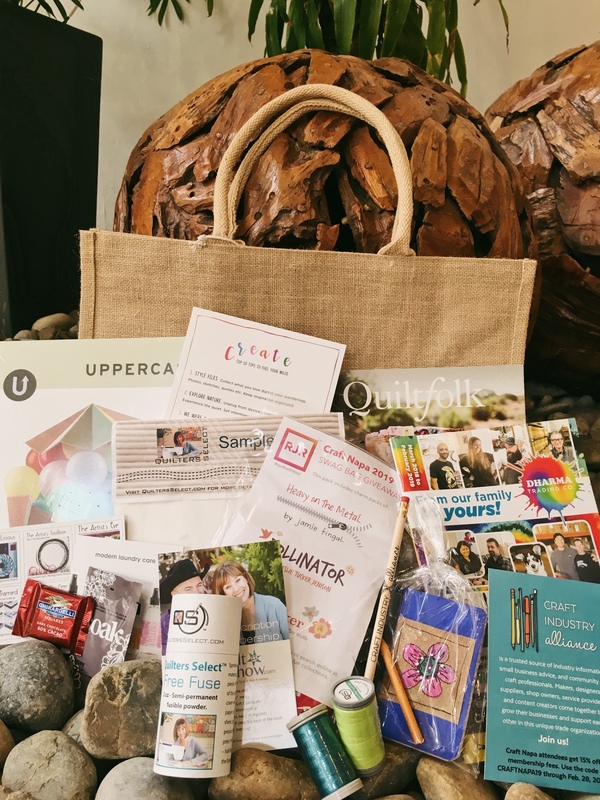 Thanks for the chance to win this wonderful bag of goodies! I have heard wonderful things about Craft Napa and hope to attend next year. Threads of Innovation is a wonderful topic for you and I hope you will post your presentation. I love the idea that use of treads can unite people. And that thread art projects can be based on the individual’s interpretation of the project. For example I am participating in Sarah Vedeler’s year long mystery quilt machine embroidery project. At first a lot of people chose the same fabrics and threads as Sarah which is fine however as the first month progressed people started sharing photos on the group Facebook page with all kinds of wonderful fabric and thread adaptations. Either way of looking at the project is OK.
I’m so new to the whole quilting process I think I’d like to know where you think quilting will go in the near (and later) future. I’m still trying to perfect the perfect 1/4″ seam. I’m also interested in what tools are available to new quilters. Everything from innovative tools that help beginners to those used by advanced quilters. And I hope you will make your presentation available to all of us so we can learn about this craft. There are so many “tools” listed on various websites that it’s confusing for beginners. Which rulers to buy, what thread choices should we make, etc. I would like to hear how I can use more of the threads and fabrics I have in a project. I need to use more so I can leave less when I die. Morbid, I know. Folded fabrics use more and some embroideries use more threads. I need more ideas how to use more and still create small quilts and wall hangings. This has the added advantage of selling more of everything to those quilters who don’t have a Hugh stash yet. I’m a STEM teacher for 7th graders. STEM is short for science, technology, engineering, and math. A lot of careers are STEM related. I try to build their foundations so they are prepared for any career path. I try to get my students interested in STEM and critical thinking skill activities. How does art (especially quilting) be integrated into STEM so it can be STEAM, so students can be more well rounded and engaged? What can we do so students/next gen can be more interested in the arts/art quilting? Pokey, I took Kerr Grabowski’s workshop with you on Whidbey Island a few years ago. I would like to hear about the most innovative and exciting surface design techniques that you have come across over the years. I would be interested in hearing how the quilting world has changed in the last decade, including styles of quilts, new and popular techniques, and changing demographics of quilters. Thanks for all you do, Pokey, for the art quilt world! What source material is the basis for work that actually gets made. What techniques including technology are used the most to create art quilts. I am interested in surface design techniques that I can incorporate into an art piece. This includes felting, dyeing, painting, embroidery, and using fabulously different types of threads and yarn (lie boucles). Hope your talk goes well! The topic of textiles in the landfill is a huge concern. What can we do about it? I would like to hear what you think might be a new niche for the industry or if you think it has all been done and there is little new. I would be most interested in whatever inspires you to say, but I’d be curious to hear of the journey you traveled to today. Within that journey, I believe will be a common thread of inspiration. ballet studio the Charleston Ballet West Virginia). I always wanted to be a ballerina. My fondest memories were of Master Van Damme saying he was going to make pea soup out of me. I also heard about this weekend from Jessel on that weekend. I was devastated as I am a quilter (and other crafts) and my current love is quilting out of fabric landscaping and memory quilts. I would love to hear how taking the steps to follow a long aspired dream has changed your life, how the joy of doing what you love gives you a new perspective on the art you create, what gives you the most joy about sharing your art and love of creating with others and the importance of just taking the plunge to accomplish the dreams and moving with the flow through both the good and bad experience. I would love to hear a synopsis of how some basic tools have evolved to where they are now and then a forward look at some of our basic tools and where they are headed in the future as much as the forefront of the industry can tell us. I would love to hear about the biggest leaps you had to make in your life, what led you to be there to choose to make them, and what helped you follow through to achieve your creative goals. Just how rapidly the industry is changing as well as the way we receive information. What does the future hold. If love to hear where you see the industry moving in the future, and how you get your creative inspiration. Enjoy San Jose!! Avoiding (or recovering from) burnout or social media management/marketing for the indie creator. Also: how to break into the pattern or fabric design side of things. I would love to hear your thoughts about the community aspect of the art quilting movement. Many of us worked in isolation for years,then the internet happened and Quilting Arts magazine happened and we were making connections all over the place! My world changed dramatically because of blogging and online groups and the ability to share our work and ideas and techniques. Seems like you have been deeply involved in this phenomenon and wonder what this has all looked like from your perspective. You’ve been an innovator several times now. How did you take the leap? How did you prepare to take the leap? It takes courage; where did it come from, and how did you overcome self-doubt? I would like to hear more about the intersection of art quilts, art and quilts. Maybe a 2 fold talk about the thread that led you on your journey and how it has been sewn into your life and the emotional impact that it has given you. I think your story of how you started and how you have turned that into who you are today would be an awesome thing… you have done an amazing job bringing all types of art to inhance the creativity of all those who come in contact with you… thanks for all you do. You are one of the most creative innovators in the industry. You started Quilting Arts magazine, added so much more to that company, worked in the Houston Quilt Show, started Craft Napa, and created your new home and workshop in CA. Just talk about how you have a dream and make it come true. After reading many of the comments I notice lots of attention to innovation which I’m interested in too, but one thing I’m aware of is how excellent the traditional and also modern work of England’s textile artists is, especially with textiles and embroidery which I’m trying to incorporate and absorb into my own work. So I have an interest in what’s new and exciting and what the techniques are available to learn from the past. You have reinvented your life several times. This last time, taking the huge leap to move to CA, build a craft barn and devise Craft Napa, is just amazing. How did you come up with the idea, develop the detailed plan and financing, survive the fires, and most of all – screw up the courage to take the leap? I would be interested in hearing how quilters, quilt shop owners, artists can stay relative in this online, instant purchase world we now live in. Talk about your dream and how you made it come true. I am a long time sewing addict but very pattern dependent! How do you break your mindset and create your own? A simple question but hard to achieve. I have talked to you at Houston and Chicago and admire your drive. Born in San Diego but Indiana resident. Just a thought, but why not follow one idea be it a block, technique, dye, etc. and trace the subject forward with the one common thread it always has. Example would be Batiks from the original wax techniques to today where it is mass produced using computers to emulate the art form. there’s been dramatic changes in the quilting industry due to innovation. i love how it has made more female entrepreneurs, while improving our quilting experience. and even though improvements have been invented, the humble needle and thread and a piece of fabric can still rock the world. Aloha! I always enjoy the experiences of your guest artists. I commend you on being invited to be a speaker at this conference. Your demonstrations of processes to create show your audience new ideas or new ways to look at ideas. I once installed a Fiber Art Exhibit in Hawaii which encompassed a wide variety of techniques and materials, including quilting. The thread of relationships between the innovative ideas made for a cohesive unit. The artists were brave and used unexpected methods to achieve beautiful results. I believe artists today need to know how to have solid, basic skills, good technique, but most of all, bravery to be innovative. Who said a quilt can’t be made out of VIVA paper towels? With a mulberry paper backing? Hand painted? I would be interested to hear your take about the future of quilting. Will it still be a thing ten, twenty years from now? What trends speak to you? Any thoughts about up cycling, recycling, repurposing fabrics for quilts? These are the innovations in quilting that have most influenced my quilting style, and these are the problems and ideas that I would love to see new innovations for. Some of the history of Art Quilting and how it has evolved and how thread has helped this process. What’s different, what’s the same about handwork and quilting these days? It might be fun to reflect on that! I would enjoy hearing about your journey through the Quilt world. Also where is the line, if there is one, between creative circles and sharing and copying in the art Quilt world. I am thinking about all of Gustave Klimpt’s artist friends copying “The Kiss” and being accepted. And a current trend of copying other artists work in a different medium even with permission and it being accepted in art shows. As a side note, with attribution, I am okay with it, but it begs the question of original art or not. Hi Pokey and thanks for a chance to win. I would like to hear your thoughts on how you brand and market yourself as a fiber artist. Sometimes I feel like I’m caught between the quilting and fine art world. I would like to hear some of your process for taking an idea and turning it into a physical project. I often get stuck with it in my head. I would like to hear your thoughts about how to elevate fiber based work within the art community. I would love to hear about your creative and productive journey! Also, besides business, where do you get your inspirations from to be consistently creative? Your Craft Napa sounds wonderful! How do you go from inspiration to finish? I would so love to hear you speak in San Jose. I just might be able to swing it. I appreciate all your work and your generosity in offering these bags full of terrific goodies. Good luck to you. I am always interested in the thought process that goes into making art. From the beginning stages to the end. you have enough comments, requests and questions to fill a book. You are an easy speaker to listen to, so a little history for the new quilters, Your experience, and what the future for quilting would be in your opinion. Growth of the industry. Importance of having informative speakers to guilds. we live in the mountains, near Yosemite, and speaking with a friend, I see where I have missed the last 10 years not being with quilting groups and learning new ideas. Info from the Computer is fine, but we need the interaction of quilters on a regular bases. Maybe a little about quilters advancing ideas, not all working on the same quilt sent out already cut and ready to put together. they are beautiful, but we need to stretch our thinking and learn about new products. Classes are getting so expensive that many of us can not take them any more, for instance Asilomar, and other locations. Interaction with other quilters in person is very important. I realized that recently when a quilting friend of 20 years came to visit. Videos don’t work as well as the live person teaching in a room of quilters. 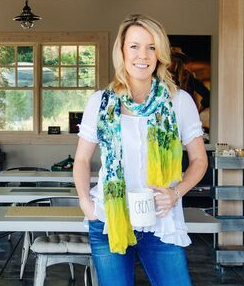 Love reading about your growth in Napa. I would love to know your story. When did you know, this is what you wanted to do with your life? How did you make it happen? What about fabrics and thread make them a unique media for expressing art? Getting braver using color, mixed media, textures, abstracts. also, deciding on quilt dimensions. The journey to your personal innovation and building of your home and event facility in Napa. The way you welcome many aspects of the hand crafting/art communities and also the support you give back to these communities. It all is connected by a fine thread. You have woven a beautiful mosaic tapestry. I say talk about this, It is a wonderful life story, very close to your heart. I would like to hear about ways to rekindle a creative spirit after life challenges have evaporated it. I have always admired how you seemed to just tackle free motion stitching with such enthusiasm when you first started learning it. I would love for you to share your thinking process. My perfectionism seems to hold me back. I’d like to hear how you got started in the industry, your creative inspiration and how your style has changed with the new products that have evolved in our industry. Hi Pokey. You have had several transitions in the ‘thread’ industry during your own career. I would love for you to incorporate the ‘innovation of your career’ and how you have woven new career paths for yourself, all successful, all involving the ‘quilting’ thread along the way and yet each of your threaded pathways has had an innovative ‘twist’. I wonder about how quilters can hold on to the traditions while using modern conveniences. Looking at the intricate quilting done by using longarm quilting, I wonder about it’s value compared to hand quilting. But then I remind myself that I don’t hesitate to use sewing machine quilting. This is a topic I’ve been thinking about a lot so I don’t know myself how I feel yet. But I know that watching longarm quilting on television quilt shows makes me feel uncomfortable with the intricacies performed by the machine and the lack of connection to the quilt by the quilter. Per the topic, I’d be interested in hearing about how social media is impacting creativity: on one hand, I’m so inspired by seeing other peoples’ work and instant help for a new or forgotten technique, yet not get caught up in the rabbit hole where I’m just looking instead of doing, or worrying that I’ll assimilate so much that I’ll lose my own point of view. How to balance the influence at our fingertips with the focused, solitary time we need as creators? I would like to hear your personal take on quilt art vs. fine art. Also, I am interested in digital design and online teaching and how to make both more personal. It seems “print on demand” is a new technology that is taking hold. In fact, I recently purchased 2 pre-printed quilts to quilt. I see putting my stash of thread to use and becoming more creative in this arena. Where is this headed and how might it change how we look at doing things differently. Perhaps a new category at quilt shows and/or experimentation and using innovative threads on a larger scale (glow in the dark as just one example). What are thread manufacturers up to? Recently I have been thinking about using thread for creating dimension in a new way. It seems we will never exhaust ideas – just look at the popularity of embroidery machines. We’ve been hoarding thread long enough, let’s use it! Oh, and how we are beginning to see machine and hand stitching merge since hand stitching is enjoying a resurgence. Exciting times are ahead and it’s not going to die with our generation – okay, reword that! Talk about picking out materials for starting a quilt. That is where I get stopped! I’d like to know what innovation(s) had the greatest affect on your artistic life. Also, I’d like to start a movement to have more fabric manufactured here in the States! The above definition speaks to me about possibilities- and what a wonderful time we live in that allows so many possibilities. But we must be aware that there is an environmental cost for all of the possibilities. How would you address what we can do to reflect this growing crisis – education, reuse of materials in manufacturing process, etc. How do you continue to stay motivated, fresh, and happy about your process and your work? And how do you balance the new with the old? My heart is drawn to the traditions of quilting which I do not want to lose. Yet, I am inspired by the modern art quilts full of vibrancy and color and meaning. Is there a balance? Is there a way to “do” both? I think I would like to hear how quilting has changed from its beginning into the art quilting we have today. I realize that is a hugh subject. I am very interested in dyeing my own fabrics. As well as carving the stamps that I use to print fabrics. I’m not sure if this is what you mean by “Threads of Innovation”. But new techniques are being thought of every day. Good luck on your talk. When your creativity is in the doldrums and the need to complete something is important to you or your business what do you do to stimulate your creativity and innovate something new. Quilting has seen a huge resurgence, me being one of those who quilted before my kids were born and have now returned to it after they are grown. It seems the majority of those involved in the quilting world are still 35+ years of age or older, so it would be great to talk about how to encourage the younger crowd to embrace this amazing craft. They are all about innovation on every level. Patterns and fabrics have changed so dramatically, all for the better! but less people are exposed to sewing at an early age due in part to change in school curriculums. As quilting really has become more of an art form and something we all do for personal satisfaction rather than the need for warm bedding hopefully budding artists out there will decide to try this method of expressing themselves. Maybe some of your wonderful crafts people would consider doing mini workshops at high schools to encourage more involvement in the craft, as well as industry groups that you will be speaking to in the spring, and they can learn how to incorporate those skills into some form of quilting. Hoping next year Craft Napa fits my schedule and I continue my education. If chosen I can come pick up my goodie bag, I live in Benicia. I would so much love to hear about your art journey throughout your life with emphasis on art quilting and where you see it going in the future. You have been such an inspiration and innovator in the field!